This episode starts with a lot of growling, roaring Yeti action in the tunnels, and he was under his blanket (not his security blanket, the other one) so much that he got mad static in his hair and it’s all puffed out like Thomas Dolby. He was mistaken about the traitor – it’s actually Staff Sergeant Arnold, or more accurately his reanimated corpse, who has been the Intelligence’s eyes and hands. I’d have guessed Harold Chorley myself. He shows up again for a few minutes this week. Having watched “The Enemy of the World” and “The Web of Fear” a couple of times since their discovery and return, I’m not sure which I enjoy more. With our son, it’s no contest – he likes the Yeti even more than the Cybermen – but I think “Enemy” is the better story and “Web” the one with better direction. Everybody has their fingers crossed that the good fellows at TIEA will find a few more missing treasures very soon. Six of the many missing episodes that would be nice to see back are the six parts of “Fury From the Deep,” the next serial in the series, which is entirely lost, save some clips and photos. Since “Deep” was the final story for Deborah Watling’s character of Victoria Waterfield, tonight was the last we’d see of the character. Watling didn’t go on to a star career; among other appearances, she had a small role in the David Essex/Ringo Starr film That’ll Be the Day in 1973, and had a recurring part in Danger UXB in 1979. Watling is much beloved by fans for her… let’s say unique line readings in various Doctor Who documentaries, fan projects, and charity specials (“Hong… KONG!” and “Who was that TERRIBLE WOMAN? !” for starters), and it’s a shame that she wasn’t given a better character in Who than the terrified, screaming orphan dashing from one horror to another. We’ll pick back up with season six of Doctor Who in February, but we’ve got plenty of TV episodes and movies to look at before then. As always, thanks for reading! After the heights of the previous episode, this one can’t help but be a bit of a comedown. Our son was very frightened when the Yeti and Travers, controlled by the Great Intelligence, take Victoria as a hostage. We also had to pause and explain what a hostage is. He really seemed to enjoy this episode, and told us that he likes the Yeti more than he likes the Cybermen, but his favorite part was the finale, when the Intelligence’s weird fungus-web stuff comes crashing through the wall of their headquarters. There’s a neat little bit of completely unintentional foreshadowing about where this show would go years down the line. The Great Intelligence becomes the first villain other than the Daleks to identify the Doctor as a time traveler and has been observing him throughout time. You can imagine, knowing the show from the present day, that the Intelligence, thwarted in Tibet in 1935, watched Earth as the seventh Doctor showed up in 1944 to fight Fenric and the tenth showed up in 1953 to fight the Wire, and so on. 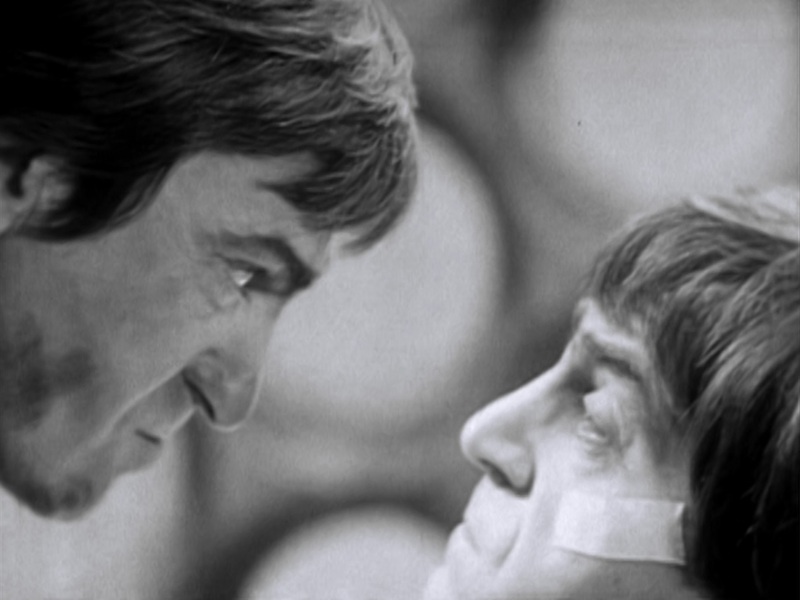 Of course, 44 years after this story was broadcast, they’d reveal that the Intelligence first met a much later Doctor in 1892, so when the second Doctor first met the villain in Tibet, the villain already knew who he was. I love that. Part three of this story is still missing; the DVD contains a reconstruction using the audio and a large selection of photos. It’s as good as can be expected for a filmstrip, but it certainly was a slog. 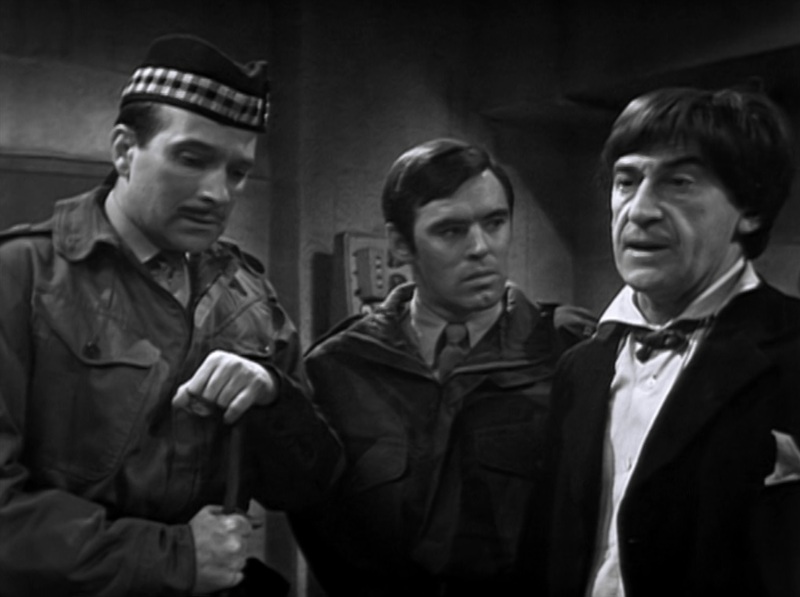 It’s a shame that it’s still gone; it introduces Nicholas Courtney as Colonel Lethbridge-Stewart. But he’s not introduced as a beloved supporting character of the future, but as one of the main suspects in the mystery of who in the base is in league with the Great Intelligence and dropping Yeti homing beacons in everybody’s pockets. We paused several times in part three to help our son through it, taking care to explain what a homing beacon is. A few minutes into part four, he said “Pause it. Hey. What’s a homing beacon?” He also didn’t understand why the Yeti keep stopping the heroes from blowing up the tunnels. We explained that we didn’t actually know that ourselves yet. He ran this information around his head for a second and said “So they don’t know what the Yeti are doing or why the Yeti want to stop them blowing up the tunnels. What we do know is if they can stop the Yeti, then they can blow up the tunnels!” That’s true, but I think adding the additional fact that stopping the Yeti will mean they won’t have to blow them up might just confuse him. Part four contains one of the all-time greatest action scenes in the entire series. 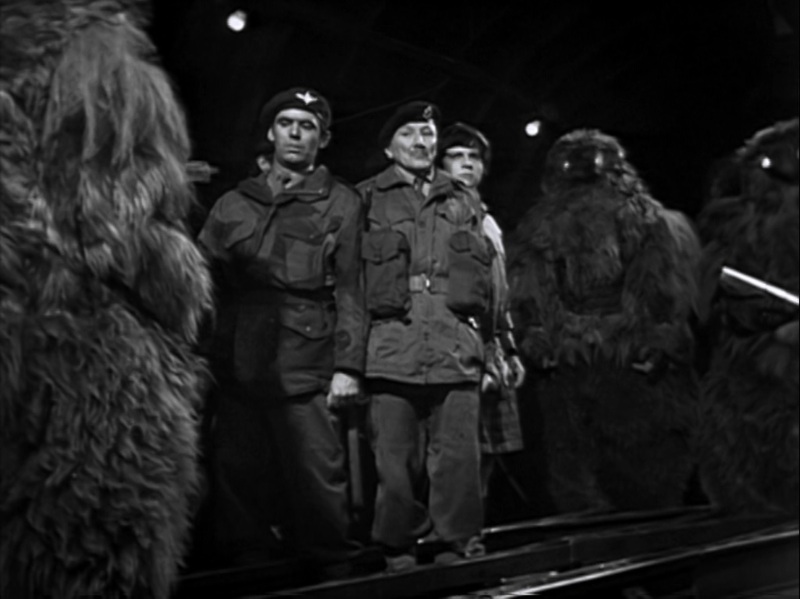 Lethbridge-Stewart takes it on himself to retrieve the Doctor’s TARDIS from Covent Garden Station and goes above ground with several soldiers, and a freaking mob of Yeti descends on them. Years ago, some snippets from this sequence were returned to the BBC. 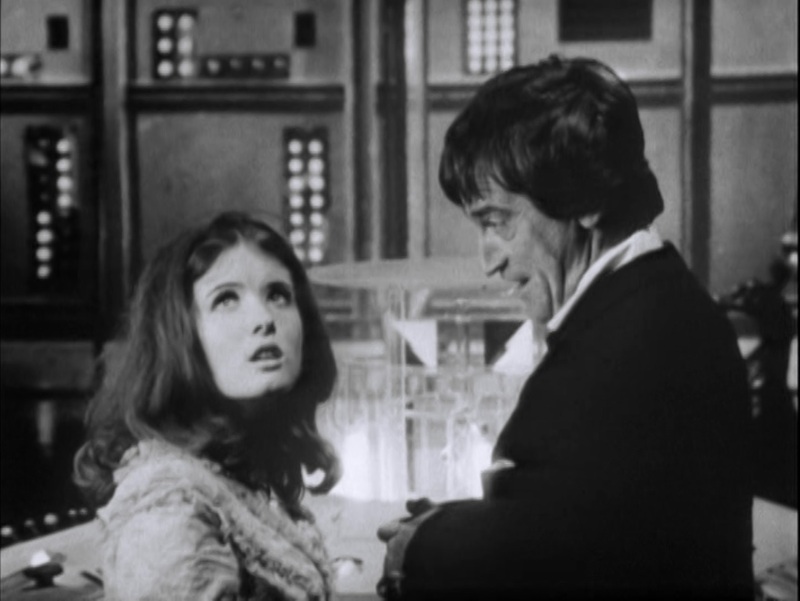 New Zealand’s TV station had censored the scene, labeling it too violent and frightening, and trimmed the episode, leaving the cuttings behind in their own archive after they returned the film print to the UK, where it was later junked. These censor clips were returned in 2002 and included in a DVD release called Lost in Time. My eyes popped about out of my skull when I saw those too-short sequences. In 2013, when this story was recovered, restored, and released, I made like Fry from Futurama, shouted “shut up and take my money,” and downloaded it immediately. I watched the second half of part four with my jaw on the floor. I don’t know that there’s a better action sequence in the whole of classic Who. As if all of his other amazing work for the series that we could rewatch didn’t cement Douglas Camfield as the program’s most popular and beloved director. And does it work for kids, as Lethbridge-Stewart’s soldiers are tracked down and mercilessly, brutally killed by the Yeti? Ours was transfixed. This is really powerful. The last guy with the colonel is dragged away, the Yeti grabbing him by the ankle and tugging him like a rag doll. He was under his blanket, eyes wide with surprise and shock. “This isn’t good and it isn’t exciting,” our son tells us, “but it is creepy and it is scary!” I beg to differ. I think it’s very exciting! It’s also funny. There’s a great tension-relaxing bit where two soldiers share their theories about what their opponents are, and I love the part where Professor Travers explains that the much younger Victoria was born before he was. Interestingly, this story is quite plainly set in 1975 or later. 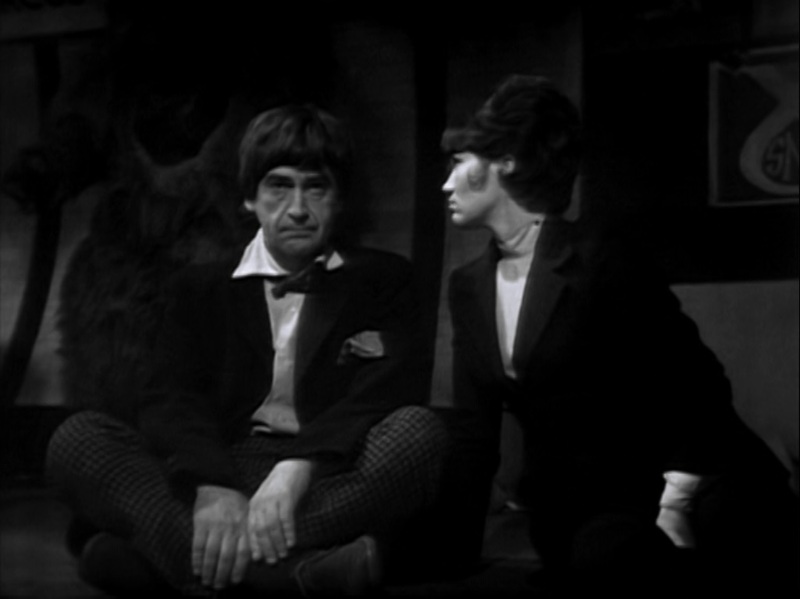 The year of the Doctor’s first meeting with Professor Travers is clearly said to be both “in 1935” and “over forty years ago.” Now, the following season, “The Invasion” will be set in 1979, placing the Pertwee years into the early eighties, each story about ten years ahead of its broadcast date. But then there’s an accidental retcon in season thirteen’s “Pyramids of Mars,” in which Sarah Jane Smith says that she is from 1980, not ’85. And then in season twenty, a deliberate retcon in “Mawdryn Undead” reset all of these earthbound adventures to their original date of broadcast or thereabout. Anybody who enjoys this kind of shenanigans can find very, very detailed web pages full of discussion about every possible “clue” in the series. I just find it more amusing to pretend that Travers said “over thirty years ago,” and keep this story in the swinging sixties. “Those monsters are so scary,” our five year-old critic told us, firmly, as the Yeti stomped around the abandoned London Underground. “They don’t have mouths!” I have to say that for all the many years I’ve watched and adored part one of this adventure, it honestly never occurred to me that one day the main thing that would frighten my son and send him behind the sofa would be the Yeti’s lack of mouths. 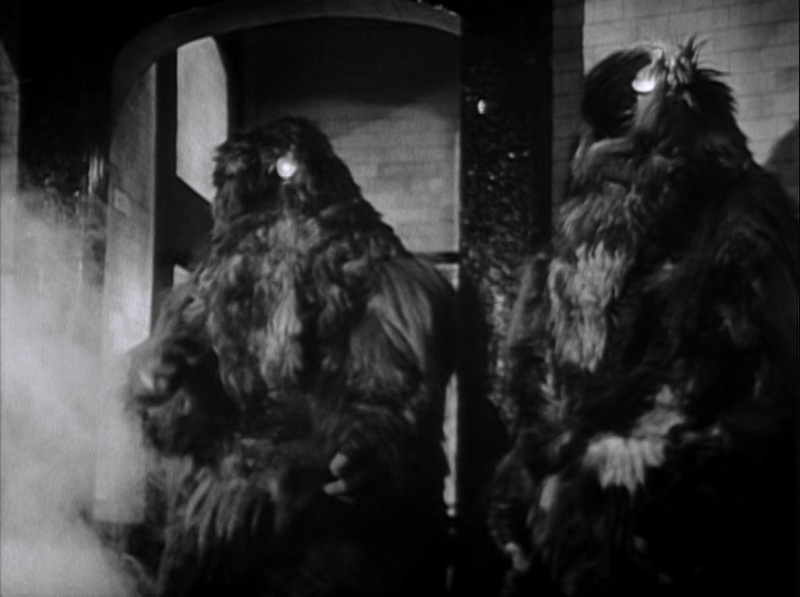 Deserted London, abandoned train stations, dead newsvendors covered in cobwebs, big hairy beasts in general, sure. But… they don’t have mouths? That’s the thing? 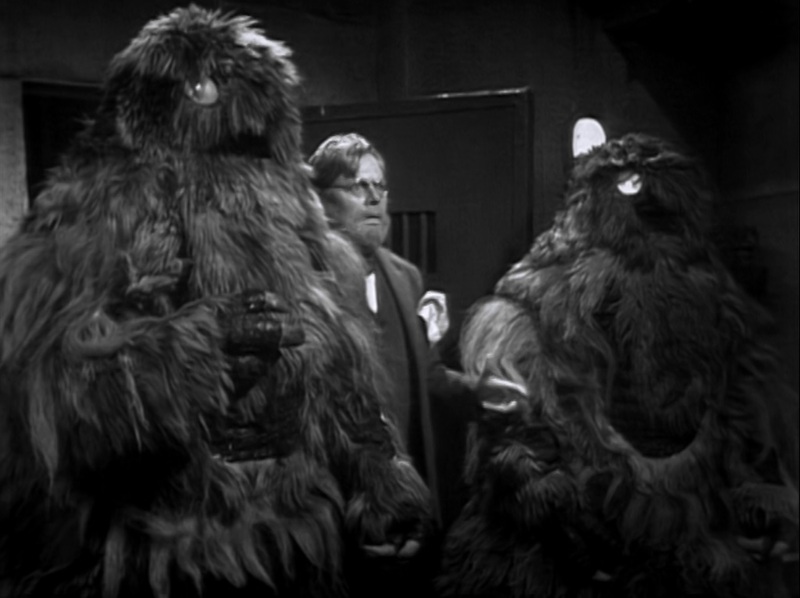 Anyway, back in October 1967, the Doctor Who production office had a huge hit on their hands with “The Abominable Snowmen,” which introduced the robotic Yeti and their formless alien controller, the Great Intelligence, and hurriedly asked that serial’s writers, Mervyn Haisman and Henry Lincoln, for another six episodes. The turnaround back in those days was astonishing. 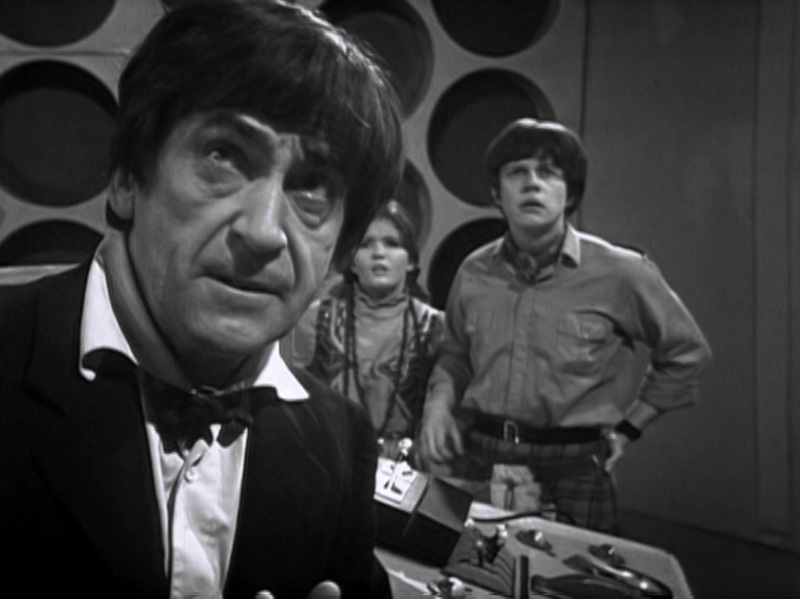 Part one aired just four months later, in February 1968. For decades, this episode was the only one to survive the BBC’s short-sighted culling, and it’s always been a favorite of mine. It’s directed by Douglas Camfield, and it has an incredibly effective and claustrophobic feel. We don’t know what the non-speaking Yeti are doing, and the eerie quiet of abandoned stations and dark railway tunnels works extraordinarily well. I’ve watched it I dunno how many times, but I’ve been saving this new restored and beautiful edition until I could watch it with my son, and it was worth the wait. It looks completely amazing, and he hid behind a blanket as a Yeti came back to life and killed some rich guy with a private museum, laughed as our heroes cut up in the TARDIS, and finally retreated out of sight as the Yeti stomped around on the platform of Charing Cross Station. 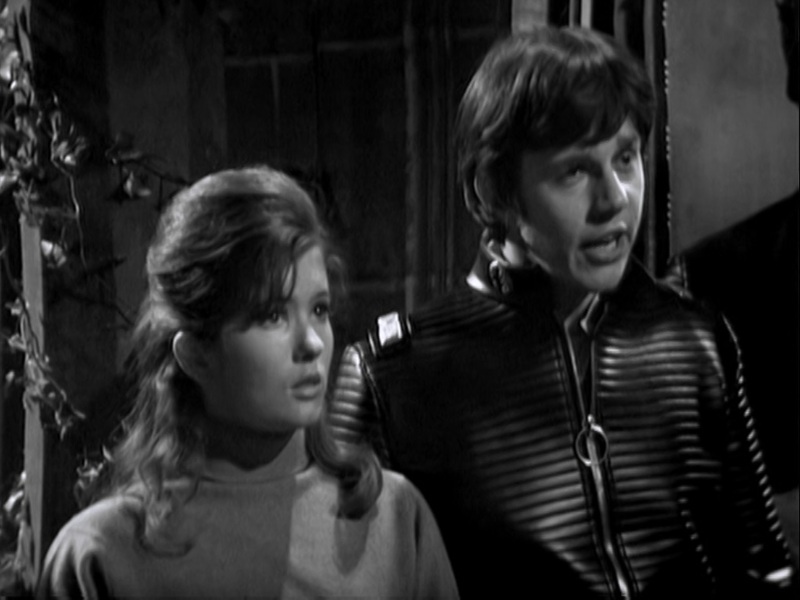 Jack Watling, the father of actress Deborah Watling, who plays Victoria, is the first actor in Doctor Who to play a significantly older version of himself, which happens a little more often these days. Watling plays Professor Travers, whom the heroes met forty years previously in the previous Yeti story. As the new production team of Peter Bryant and Derrick Sherwin found themselves enjoying this modern day adventure, they entertained the idea of making the older Travers and his scientist daughter Anne (Tina Packer), along with a character we’ll meet in a couple of nights, into a secondary supporting cast. More on that later on. This episode also introduces Jon Rollason, who, six years ago, had played one of John Steed’s partners in the second season of The Avengers, as an obnoxious television reporter assigned to cover the military’s operation to save the evacuated London. He’s really entertaining. There are several other military characters operating from an old Blitz-era underground bunker, and while they all make it out of this episode safely, that’s going to start changing soon.